This popular 4 bed villa to rent is set in a quiet part of Los Cristianos yet bars, restaurants and shops are all close by. The villa is located over three floors, with the living area on the entrance floor and 3 bedrooms upstairs. A further bedroom is located on the lower level. The villa is comfortably furnished and is built on three levels. On the entrance level the property offers a spacious lounge equipped with a 42inch TV with satellite TV including all the normal UK channels. The living area is fresh, spacious and comfortably furnished with 2 x leather sofa. On this level, there is also a bathroom / shower room. The fully fitted kitchen includes an oven, hob, microwave, large fridge/freezer, dishwasher, kettle, toaster and a washing machine. There are large patio doors leading out from the lounge onto a terrace that overlooks the pool area – an ideal spot for al-fresco dining. The villa enjoys its own built in BBQ area on a separate terrace. Vista Hermosa has a lovely pool area with spacious terraces that are furnished with a patio table, chairs and sunloungers. The pool area has a large table and chairs and 8 x sun beds. The pool measures approx. 6.5 x 3.5m. Master - double bed with ensuite (bath and overhead shower). There is also a cot bed. Patio doors lead to an upstairs terrace and sea views. 2nd bedroom - double bed. 2 x seater sofa. 3rd bedroom - twin beds. The 2nd and 3rd bedroom share a family bathroom with walk-in shower. The lower level has been converted into almost a separate living area with large double bedroom, bathroom , living room and kitchenette. Also on the lower level is a unique steam-room too!! Air conditioning is supplied on the lower level. Fans are provided in all other rooms. Villa Grounds: Large private Pool, sun beds, table and chairs, terrace, built in BBQ. There is a selection of very nice bars and restaurants within walking distance and the resort centre and beach are beyond that. 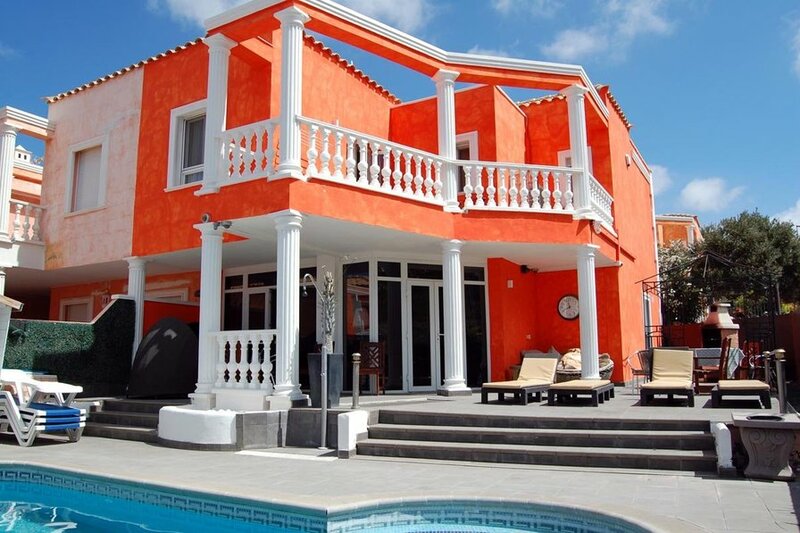 This is a fantastic villa to rent in Los Cristianos in a great location. Wi fi is available at the villa. There is an extra charge for wi-fi of 25 Euros per week. Payable to the villa caretaker on arrival. A single mobile air con unit can be provided at 50 Euros per week. Payable to the villa caretaker on arrival.